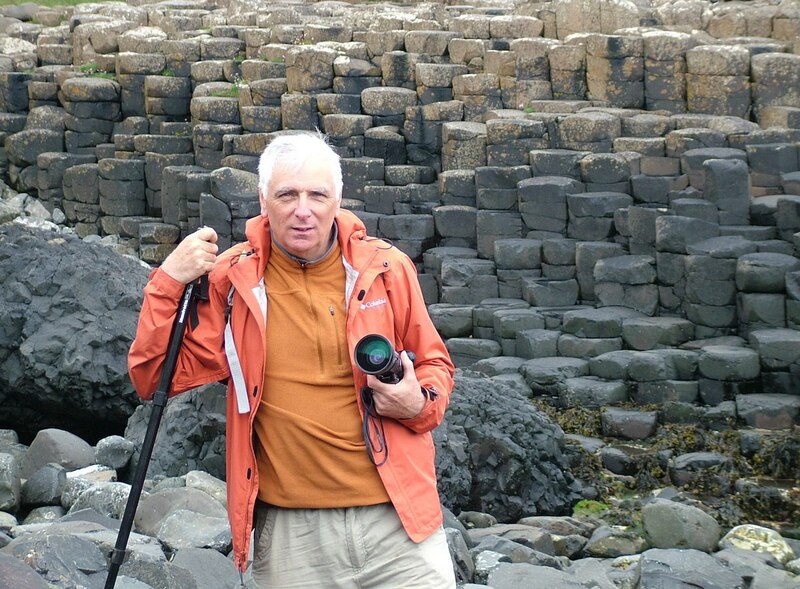 Bob and I arrived in Northern Ireland a day earlier under rainy skies that persisted into the following morning and dampened our hopes for a clear day to visit the Giant’s Causeway. In light of the inclement weather, we chose to tour the Bushmill’s Distillery en route as a means of killing a couple of hours, and lo and behold, by the time we drove a little further east to the UNESCO World Heritage Site, the rain had stopped. We had spent the night in Portrush, just north of Londonderry, and continued along the scenic Causeway Coast towards the town of Bushmills. That scenic stretch of coastline features inspirational sites such as craggy headlands and dramatic ruins. It was with relief when we pulled into the massive parking lot because one, there was a modest number of vehicles and buses lined up there, and two, the afternoon promised clear skies with fairly decent light for photographing the remarkable and unusual formations. 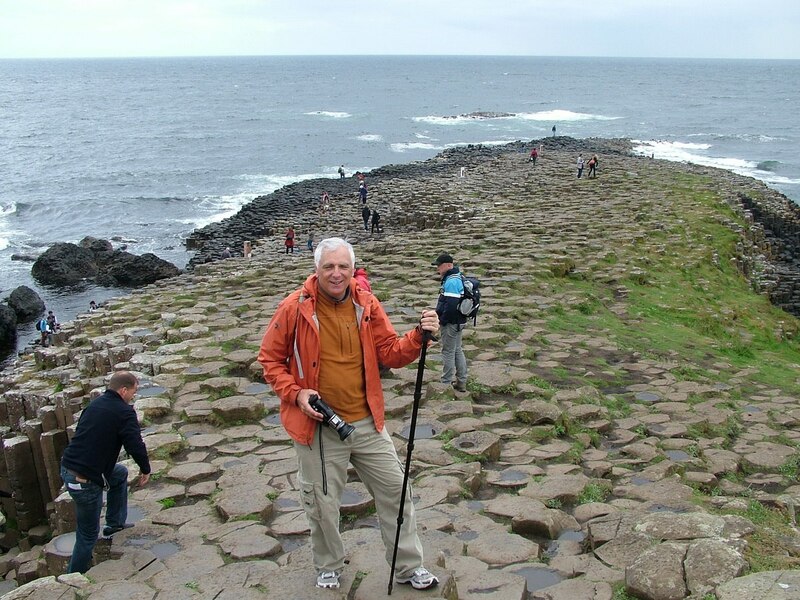 As always, Bob and I enjoyed the leisurely hike from the parking lot to the actual location of the Giant’s Causeway at the shore, about one kilometre (half a mile). 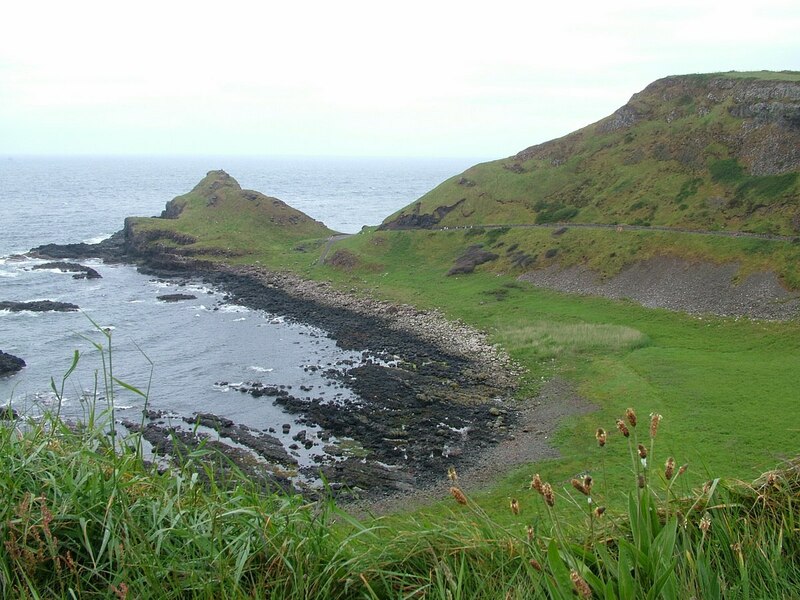 As we descended the cliffs and drew closer to sea level, it was possible to gain some insight into the formation of the landscape from the eroded cliffs flanking the Causeway. 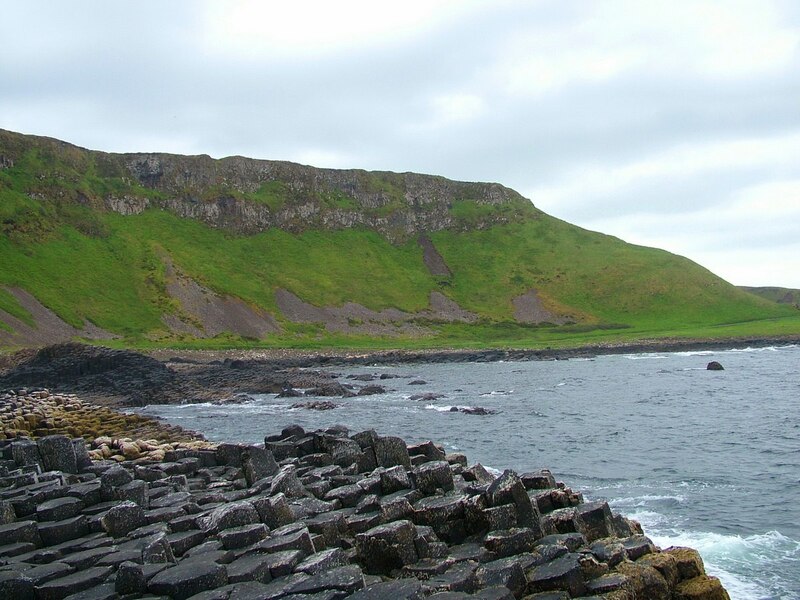 Volcanic activity about 61 million years ago deposited enough lava to fill in the valleys of this region of County Antrim and resulted in an immense lava plateau, the Thulean Plateau now referred to as the Antrim Plateau. 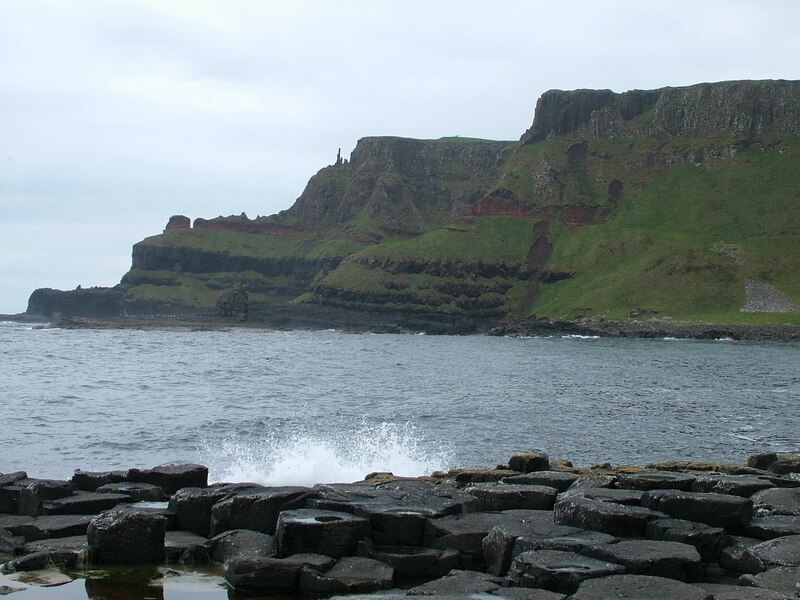 Some 3 million years later, further volcanic eruptions, followed by profound transformation during the Ice Age as recently as 15,000 years ago, shaped the Giant’s Causeway and impressive Causeway Coast into what it is today. 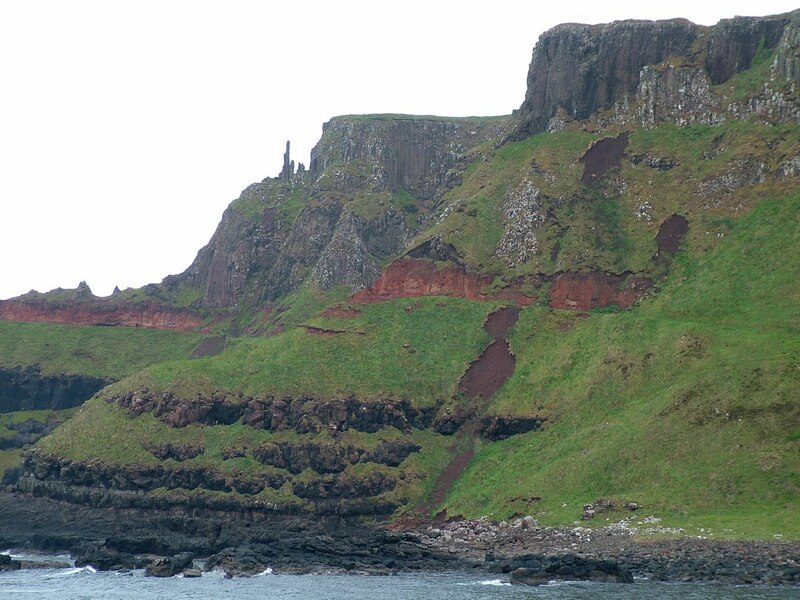 they formed steps that mounted the lower slopes at the foot of the Antrim Plateau. 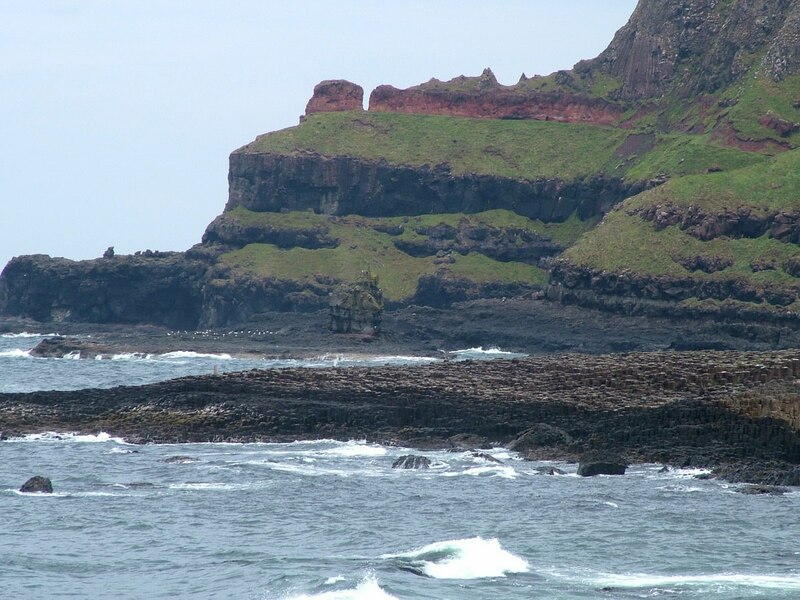 This amazing sea-level promontory was discovered in 1692 by the Bishop of Derry and made known to the world a year later. Because of the difficulty in accessing the place, it was not until the 19th century that the site attracted tourists. 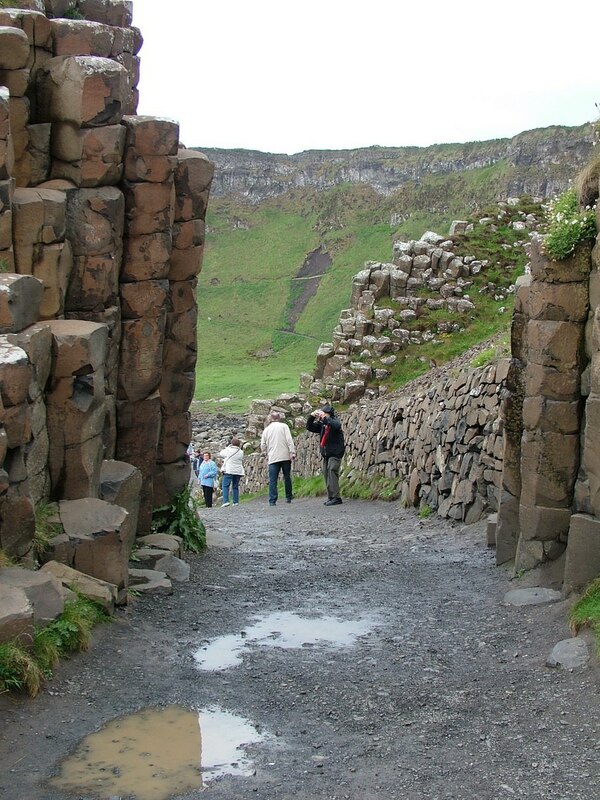 For a period of time, sightseers were conveyed to the shore on the Giant’s Causeway Tramway, but thankfully, most vestiges of commercialism were removed in the 1960s when the National Trust assumed responsibility for the protection and care of this World Heritage Site. 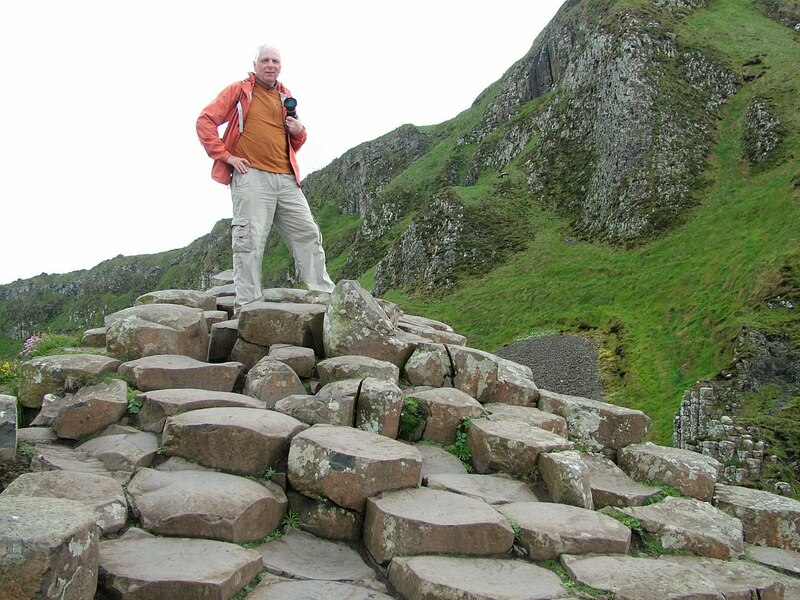 When Bob and I first stepped onto the conglomeration of hexagonal stepping stones that compose the Giant’s Causeway, we were transported back in time. Our imagination took flight and traveled along the pavements into the mists and legends of the past. 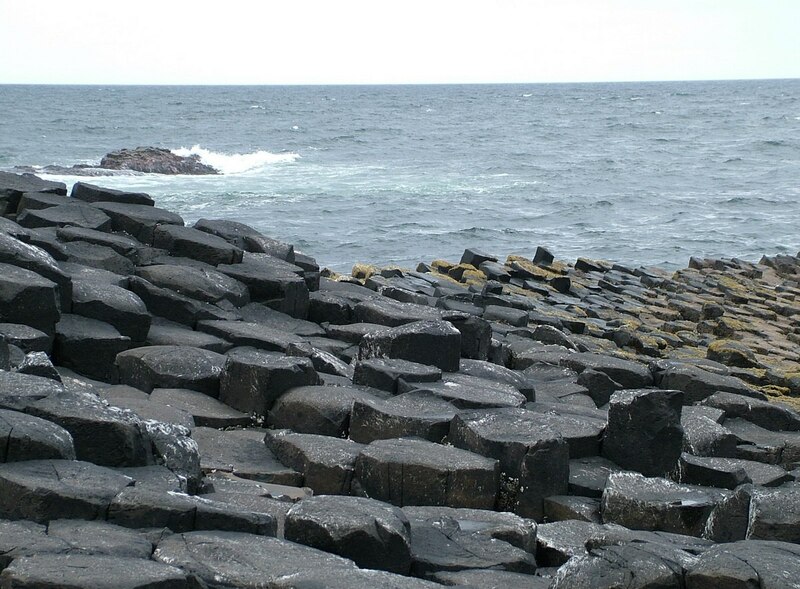 No longer were our thoughts on the creative turbulence of the bygone volcanic age but rather focused on the myth of the mighty giant, Finn McCool, who laid the causeway as a path across the sea to his lady love where she lived on the island of Staffa in Scotland. 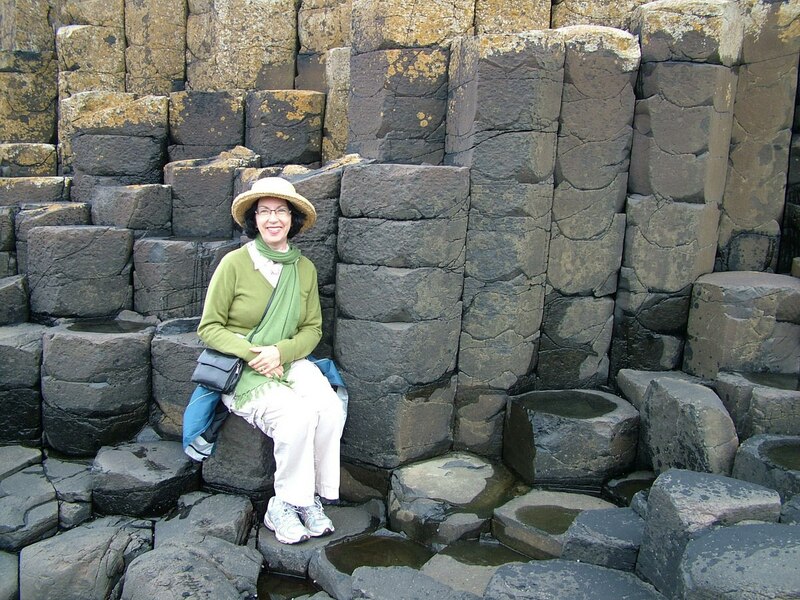 The basalt columns extend for hundreds of yards into the crashing surf then disappear beneath the sea, only to reappear again on the island of Staffa, substantiating the myth. 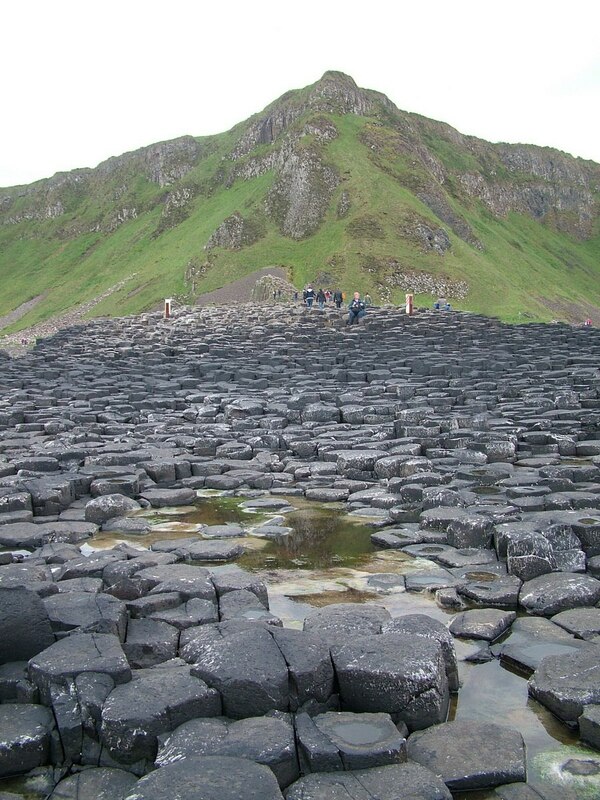 As Bob and I stood looking out over the bizarre formations, we marveled at the majesty and mystery of the place. 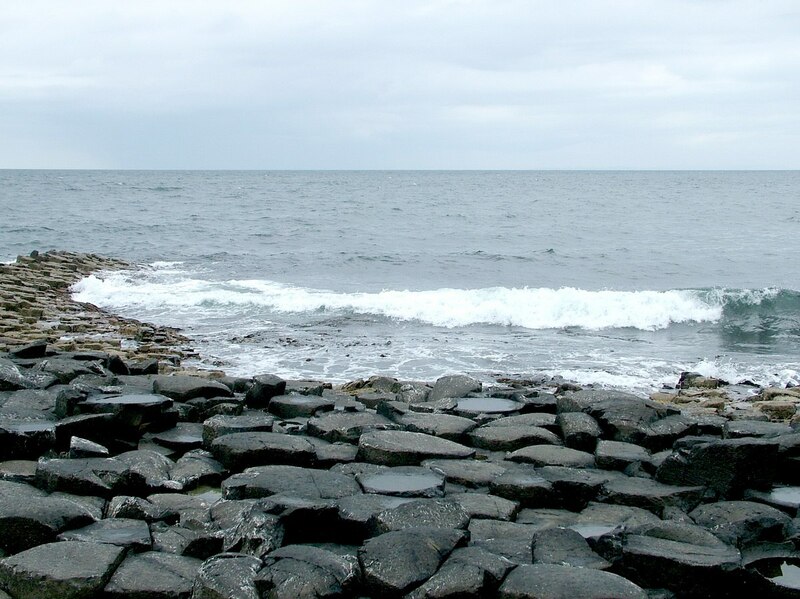 A less energetic group of visitors had been transported by bus from the Visitor Centre to the shore, but even though they scrambled over the Causeway like busy bees, the activity did nothing to diminish the magic of the experience. 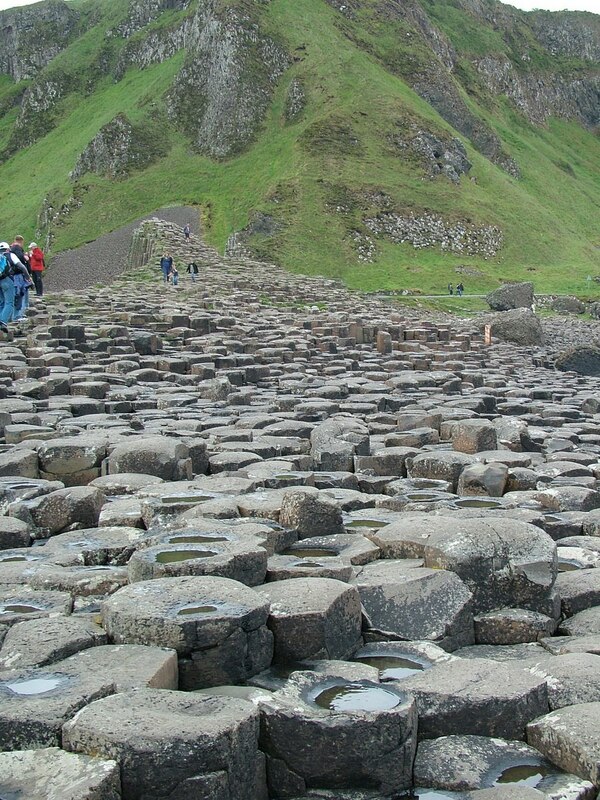 Giant’s Causeway is quite a marvelous collection of between 37,000-40,000 bizarre basalt columns clustered like a giant honeycomb next to the shore and have stood as a natural rampart against the unbridled ferocity of Atlantic storms for millions of years. It is the rugged symmetry of the columns that stirs much intrigue. 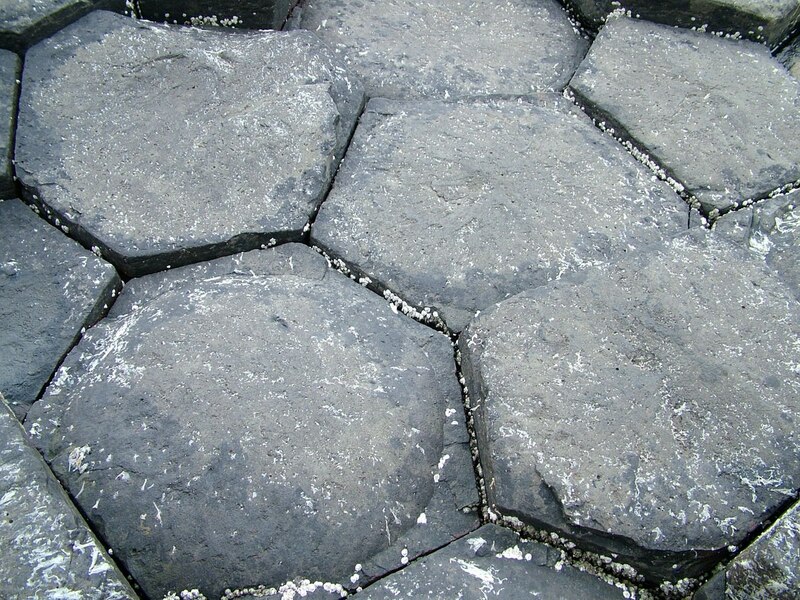 It is because the massive layer of molten basalt cooled rapidly that it shrank and cracked evenly into polygonal-shaped blocks. Much as mud does when it dries out, giant cracks resulted as the lava became cooler, and these formed columnar jointing beneath the surface. 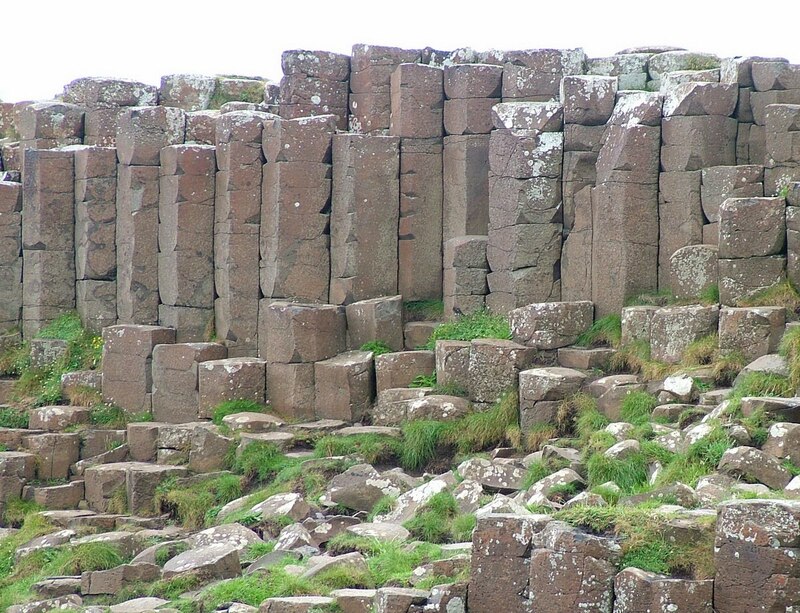 Pressure between the basalt columns caused the pillars to fracture horizontally and spawn millions of fairly uniform polygonal “biscuits” that remained stacked where they cracked. Bob and I reveled in the cookie-cutter “biscuits” that were so close-set that they formed a pavement upon which to walk. With bizarre regularity, most of the stepping stones have 6 sides and measure anywhere from 12-20 inches (30-50 cm) across, but there are some defined by four, five, seven, or eight sharp sides. In fact, when we moved from one stepping stone to another, we were actually walking on the exposed uppermost layer of each fractured column, and it is because the heights of the columns vary that a stepped surface is created. 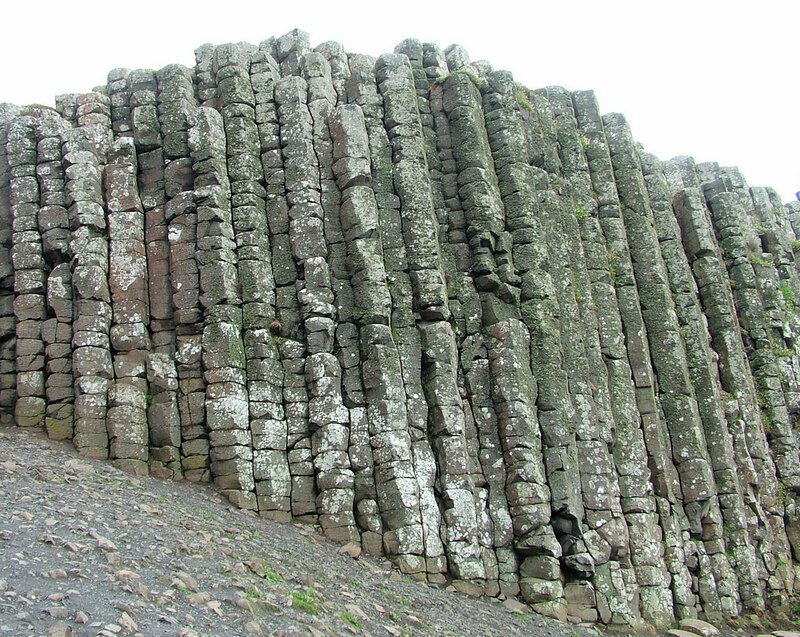 The tallest of the basalt columns is about 12 metres (39 ft) high. At the periphery of the assembled columns, the action of waves and assault by the elements has caused some of the columns to split apart and tumble into a pile of loose “biscuits”. 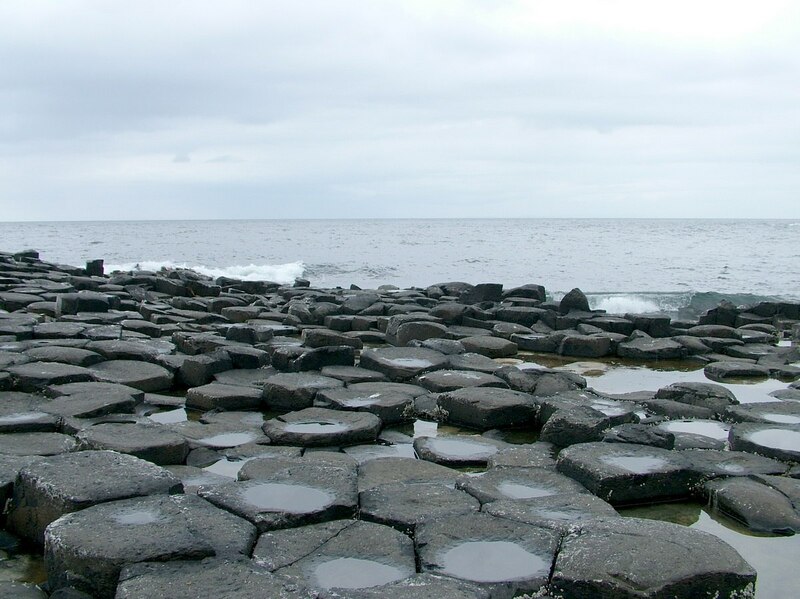 As Bob and I lingered on the outstretched promontory, we were grateful for the cessation of precipitation, but where earlier drizzle had accumulated, it served to accentuate the concave upper surfaces of the pillars. 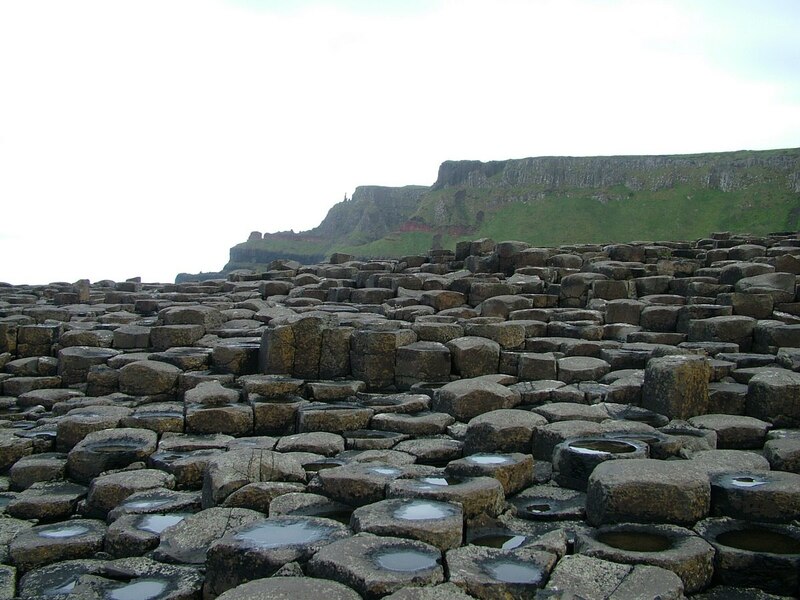 In most cases, the horizontal fractures of the pillars produced a concave top face and a convex bottom face, so the stacked “biscuits” resemble ball and socket joints that have given substantial stability to the structures for all these millions of years. Despite all the people milling about, the location afforded lots of opportunity for Bob and me to find our own personal space. The pounding surf and soft ocean breeze muffled any sounds that might intrude upon our own peaceful thoughts. As we stood within feet of the sea and contemplated the grandeur of the Giant’s Causeway, a sea lion popped its head above the surface of the water. 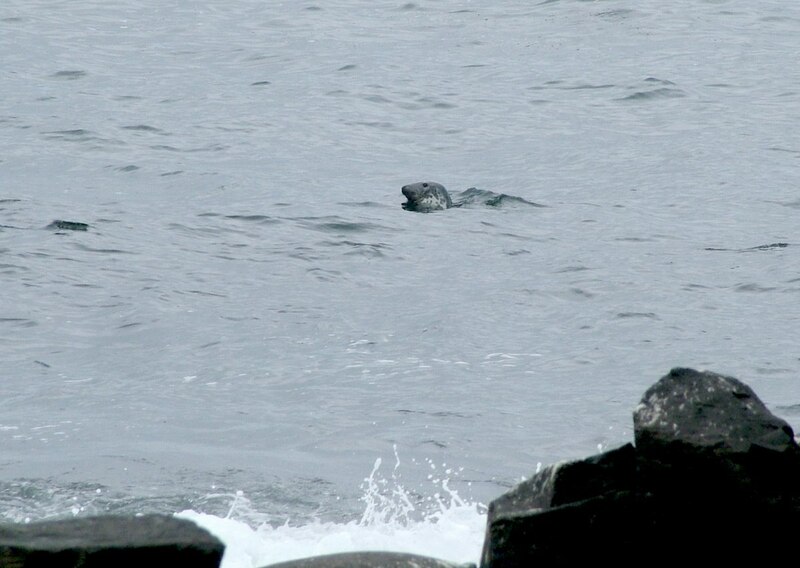 We were amused for several minutes as numerous sea lions frolicked in the waves and then moved off out of sight. It seemed that no one else even took notice of them. Bob and I then turned our attentions away from the columns where they stand against the sea, and walked up the “steps” to higher ground. When we looked to our left, near the brow of the plateau, we could distinguish the silhouette of free-standing basalt columns known as the Chimney Stacks. 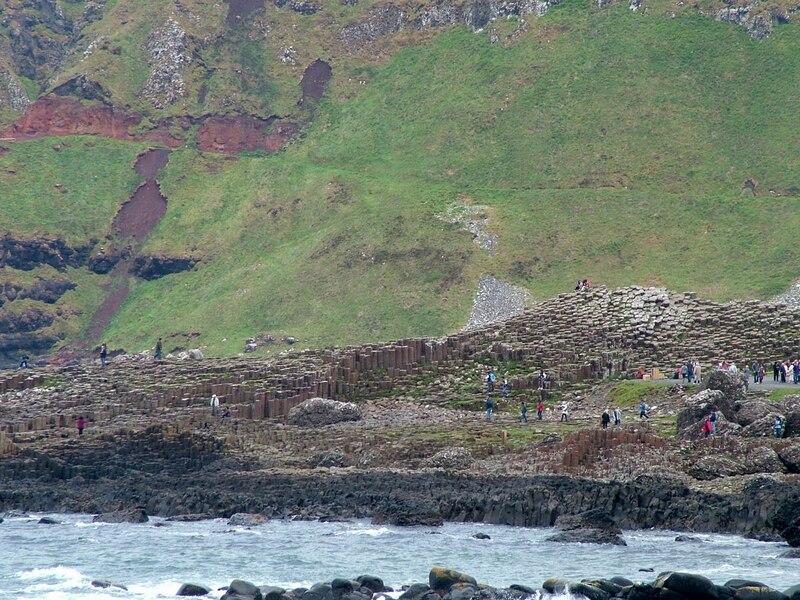 Hearkening back to the story of the mythical giant, Finn McCool, these few columns that remain standing, while most of the rocks around them have fallen, can be interpreted as the chimney stacks that mark the location of Finn’s house. What a fanciful way of naming this particular feature. With our feet again firmly planted on the flat walking trail, Bob and I proceeded to investigate a little further along the shore at the base of the cliffs. Rounding one corner of the sinuous footpath, Bob and I were taken aback by the massive stretch of exposed columnar basalt. The symmetry and scale of the visible rock section, as well as the quality of preservation, combine to present a spectacle of exceptional natural beauty. This particular stretch of columns is quite similar to those near Port Noffer that are described as The Giant’s Harp or The Giant’s Organ. 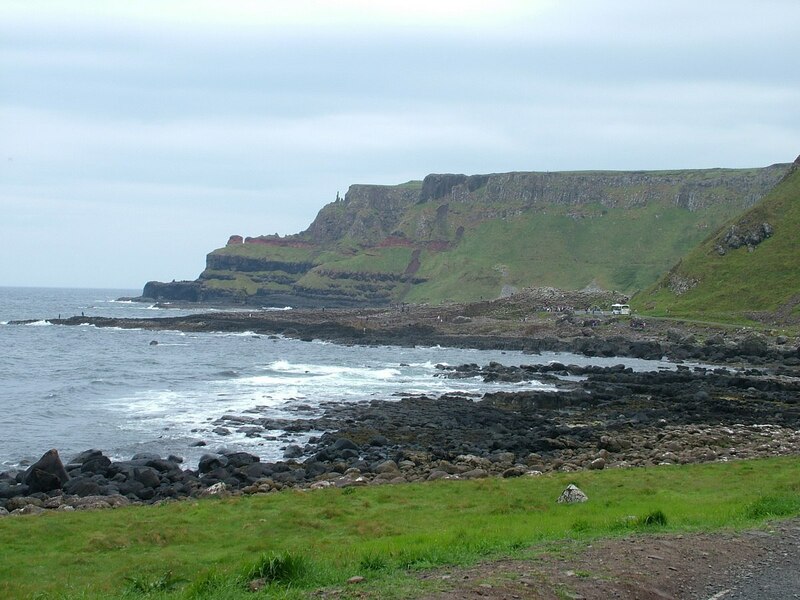 The Giant’s Causeway is the only UNESCO World Heritage Site in Northern Ireland, and it is considered the jewel in the crown of the otherwise spectacular and dynamic coastal landscape in County Antrim. 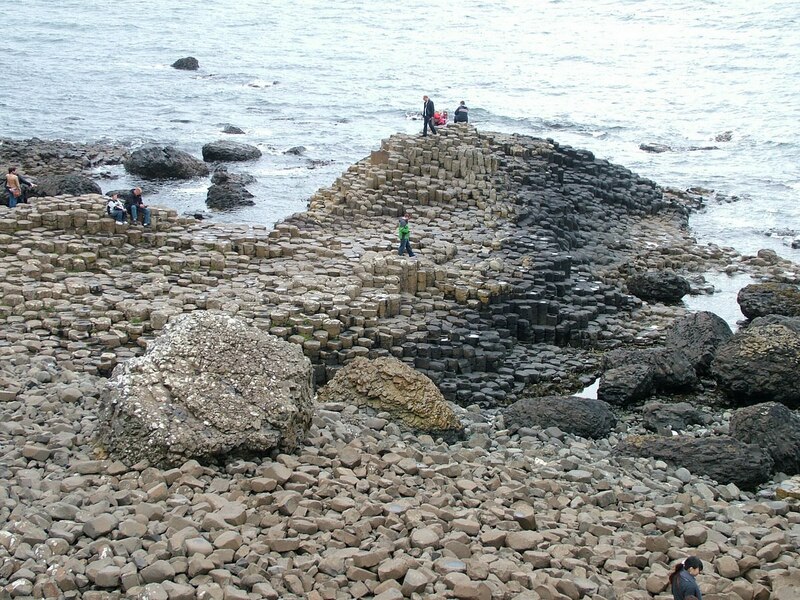 With its expansive spread of interlocking prisms and neatly packed columns, the Giant’s Causeway has been ranked alongside Mount Everest and the Giant Redwoods of California for its importance to mankind. 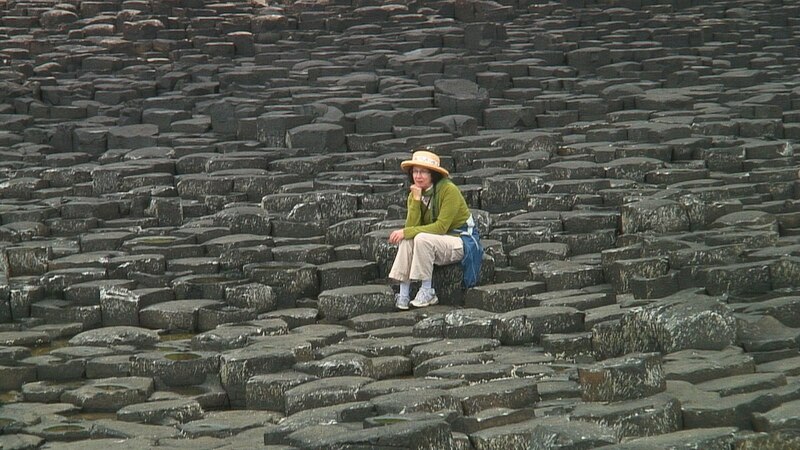 There is no wonder that The Giant’s Causeway has become such a popular destination for holidaymakers. 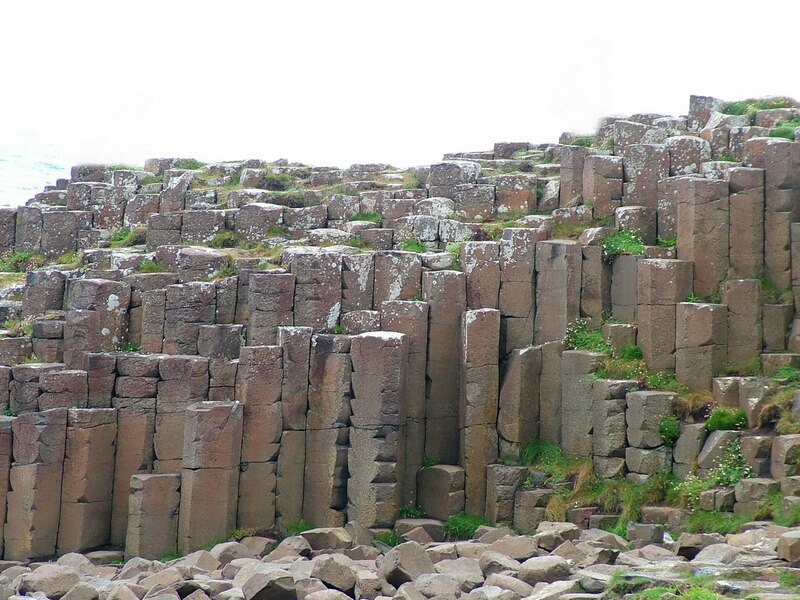 I know Bob and I were both fascinated and inspired by the rugged symmetry of the columns that form this jagged headland. They represent a unique combination of features that left us in awe.